Haruhi Suzumiya. She is the cutist girl.. Wallpaper and background images in the Haruhi Suzumiya (Character) club tagged: haruhi suzumiya is A cutie. She is the cutist girl. 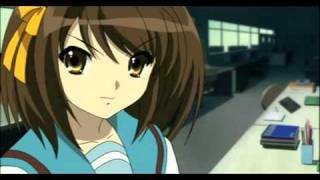 This Haruhi Suzumiya (Character) photo contains anime, komik, manga, and kartun.